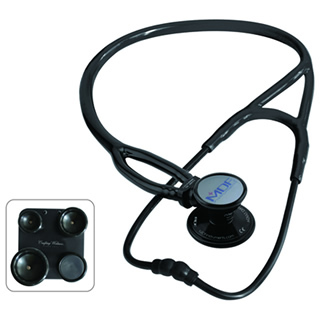 It might sound like a contradiction - a lightweight cardiology stethoscope. But it doesn't stop there. It has a classic Sprague Rappaport-like dual acoustic output, but with an innovative, patented X-configuration dual-lumen tube construction that eliminates the rubbing that can cause acoustic interference. The convertible cardiology bell can be quickly replaced with a pediatric diaphragm for versatility in assessing adult and pediatric patients. The MDF® Cardio-X™ Stethoscope delivers accurate auscultation of heart, lung, and Korotkoff sounds with acoustic integrity and clarity. An ergonomic design ensures comfort for the doctor and patient, even during extended use. Precisely handcrafted, the MDF® Cardio-X™ revolutionizes high-performance stethoscopes and is quite simply the ultimate in auditory diagnostics with unmatched performance and durability. The handcrafted patented light-weight aluminum dual-head chestpiece is precisely machined and hand polished for the highest performance and durability. The patented dual-output, full-rotation acoustic valve stem features SoundTight™ GLS technology to seal in sound, and the green indicator dot allows the user to easily identify the active sound channel. The chestpiece is fitted with an ultrasensitive diaphragm sealed with a non-chill retaining ring to provide a secure acoustic transmission of heart and lung sounds of 100Hz to 1000Hz. The extra large bell, crowned with a non-chill bell ring, provides greater sound amplification and isolation of low frequencies (20Hz to100 Hz) and can be easily converted to an included screw-on pediatric diaphragm assembly for the assessment of pediatric parients. Constructed of latex-free PVC, the patented 2-in-1 X-configuration non-stick acoustic tubing maintains two uninterrupted sound transmission channels to preserve acoustic integrity while sealing out extraneous sounds, even in high-noise conditions. The thicker, denser PVC construction prevents cracking and wearing that can occur from repeated use. Adjustable headset constructed from chrome-plated brass allows the user to create an individualized fit. Soft silicone ComfortSeal™ eartips conform to the ear to seal out extraneous noise while ensuring comfort during extended use. Patented SafetyLock™ eartip adaptors lead the industry in user safety.